Where does the Whole Foods turkey really come from? The DxE #OpenRescue team exposes horrific abuse at the nation's most celebrated turkey farm and rescues #SarahAndAngie from certain death. Liberation, not torture, is #WhatAnimalsDeserve. Sarah and Angie were born in a filthy, crowded shed of a Whole Foods turkey supplier. They never knew their mothers. Their faces were mutilated. And by seven weeks, they were on the brink of death -- starving, unable to fend for themselves, and trampled by thousands of other animals. They huddled together as they awaited a violent death, two of the 43 million victims of the deadly Thanksgiving feast nationwide. Yet Sarah and Angie were raised by one of the most celebrated farms in the Whole Foods supply chain, one of only 3 suppliers (out of 2,100+) given the highest 5+ rating by the Global Animal Partnership. Sarah and Angie’s abuse is one small part of a much larger lie -- the myth of “humane” animal agriculture. Sarah and Angie were two of the lucky ones. Direct Action Everywhere investigators found them and took them immediately to receive urgent care. But millions of other birds never get a chance at life, despite having the same feelings that you and I have. 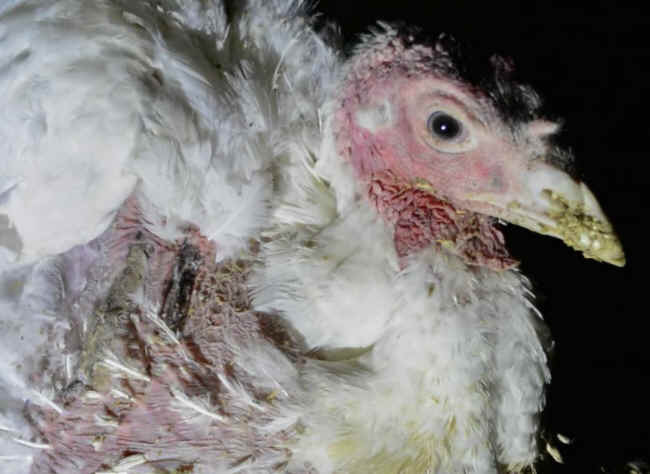 Mutilation of beaks - to prevent turkeys from pecking one another to death in overcrowded conditions - causes not only incredible pain but starvation and death. Up to 50% of the birds died in a span of weeks, and everybird who weakens is trampled to death by thousands of others. Read FULL INVESTIGATORY REPORT (PDF) here!